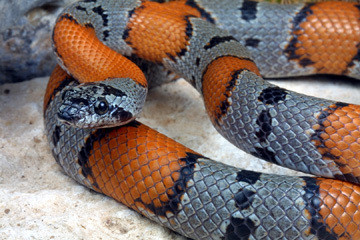 Called one of Texas living gems by naturalist writer Alan Tennant, these orange and gray, or gray and gray, kingsnakes have long been fancied by hobbyists. Once thought to be rare, it has since been determined that the desert dwelling alterna are one of the more common snakes throughout their known range, which includes parts of Northern Mexico, Southwestern Texas, and parts of Southeastern New Mexico. Hobbyists are responsible for much of the knowledge regarding the habits of these secretive animals, both their reproduction and management in captivity and their natural history in the wild. These hobbyists are also responsible to expanding the known range far beyond originally known. Here you may post messages or questions pertaining to all aspects and issues regarding the keeping, breeding, health, and conservation of Gray-banded Kingsnakes, Lampropeltis alterna.